Scottsdale Art Auction presents their 2018 auction on April 7th 2018, with online bidding via iCollector.com. There are over 350 Lots in the online catalog available for viewing, absentee bidding, and live bidding. This auction brings together important Western wildlife and sporting art for bidders from around the world. The day is split into two sessions; opening at 9:30 AM Pacific Time and Noon Pacific Time. Scottsdale Art Auction holds over 150 records in the field of historic and contemporary Western Art. In 2015, they featured works by masters from Frederic Remington to Howard Terpning, from Charles M. Russell to Martin Grelle, from N. C. Wyeth to Kyle Polzin and set a new world record for a painting by G. Harvey, making history with his magnificent 36 x 48 inch canvas History in the Making ($409,500). In 1889, Thomas D. Murphy of Red Oak, Iowa, publisher of the local newspaper, had an idea. Adapt his printing plant and expertise and create calendars with exquisite reproductions of paintings by American masters. Murphy invented the advertising art calendar and one of the first painters Murphy contacted was Thomas Moran. The idea was so successful that Murphy calendars would be purchased and given away by banks, insurance agencies, livery stables, auto dealers, shops, businesses and manufacturers for a century. Thomas Moran turned 70 in 1907. Time was marching on. Moran was already the “Grand Old Man” of American art with a beard as long as the list of accolades he’d received. His wife, two of his brothers, and his only son had passed away. And art was changing. Modernism and the new century were rising together. Moran responded by throwing himself into his work, traveling with his daughter and painting throughout the West and returning to Great Britain, the country of his birth, to paint in the mountains of Wales in 1906. Moran’s energy and drive furnished at least 60 paintings that were replicated not only in Murphy’s calendars, but in the seven travel books Murphy wrote. 1907 found Moran back in Arizona, hard at work. South of Flagstaff and the Grand Canyon, the Coconino National Forest is home to magnificently striated red rock formations, including those around Sedona, and is crisscrossed by tumbling creeks and rivers that irrigate scented forests of Ponderosa pine. From red desert to green Alpine tundra, the Coconinos are astonishingly diverse and stunningly picturesque. Inspired by the beauty of the area, Thomas Moran’s Solitude. The Coconino Forest, Arizona places the viewer–a weary but happy hiker, perhaps–at the onset of what promises to be a dramatic sunset. Fiery hues filter through the pines. The rim of a red rock canyon reflects hazily in a still, sylvan pond. A short walk will see you to a panoramic vista, red glowing on red, just as the sun goes down. You feel solitude, not loneliness, and a frisson of anticipation. And though Thomas Murphy reproduced Solitude. 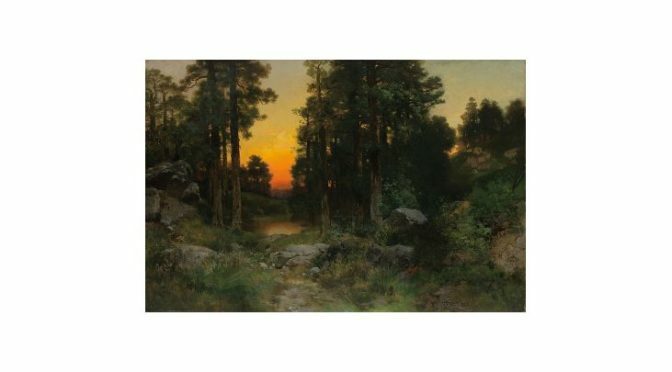 The Coconino Forest, Arizona on his calendars, it must have resonated in some deep way because he kept this painting (and In the Borda Gardens, Cuernavaca, Mexico) for his own pleasure and for his family to enjoy. Scottsdale Art Auction is proud to present their 14th annual event. They can answer all questions through email or telephone from interested bidders. bsentee bidding is currently open and bidders can join the live bidding on auction day. All pieces are available for viewing on iCollector.com by searching for Scottsdale Art Auction.